While crooked teeth are usually responsible for a malocclusion (poor bite), the root cause could go deeper: a malformed maxilla, a composite structure composed of the upper jaw and palate. If that’s the case, it will take more than braces to correct the bite. The maxilla actually begins as two bones that fit together along a center line in the roof of the mouth called the midline suture, running back to front in the mouth. The suture remains open in young children to allow for jaw growth, but eventually fuses during adolescence. Problems arise, though, when these bones don’t fully develop. This can cause the jaw to become too narrow and lead to crowding among the erupting teeth and a compromised airway that can lead to obstructive sleep apnea. This can create a cross-bite where the upper back teeth bite inside their lower counterparts, the opposite of normal. We can remedy this by stimulating more bone growth along the midline suture before it fuses, resulting in a wider maxilla. We do this by installing a palatal expander, an appliance that incrementally widens the suture to encourage bone formation in the gap, which over time will widen the jaw. An expander is a metal device with “legs” extending out on both sides and whose ends fit along the inside of the teeth. A gear mechanism in the center extends the legs to push against the teeth on both sides of the jaw. Each day the patient or caregiver uses a key to give the gear a quarter turn to extend the legs a little more and widen the suture gap. We remove the expander once the jaw widens to the appropriate distance. 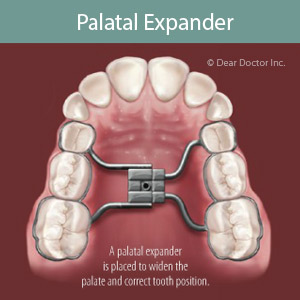 A palatal expander is an effective, cost-efficient way to improve a bite caused by a narrow jaw, but only if attempted before the bones fuse. Widening the jaw after fusion requires surgery to separate the bones — a much more involved and expensive process. To make sure your child is on the right track with their bite be sure to see an orthodontist for an evaluation around age 6. Doing so will make it easier to intervene at the proper time with treatments like a palatal expander, and perhaps correct bite problems before they become more expensive to treat.